The second major new feature is the Winamp Remote. This acts like a local media server, cataloging your tracks and videos and then enabling you to access them from another device, including other PCs running Winamp or via a web browser, various mobile devices, and game consoles (Playstation 3, XBox 360 or Nintendo Wii). However, unlike iTunes, sharing isn’t restricted to devices on the local network, and instead you can also share your music over the Internet. To make this relatively simple, Winamp prompts you to send an email (or SMS text message) to a friend to let them access your playlists from their computer (they’ll need to create a free account to verify their identity, but only once). In this regard, Winamp Remote makes iTunes’ network sharing features seem rather puny and inflexible. Also new to version 5.5 is the “Bento” skin. This is a move away from Winamp’s traditional multi-windowed interface (the default skin), which can be confusing and cluttered at times. Instead, the new skin only has one window which is more in keeping with other media management software. The rest of Winamp performs as you’d expect it. It is still a very good media player; responsive, highly customisable, able to cope with many formats and yet still has a low demand on system resources. It will synchronise with a number of portable media players, including iPods*, making it a potential replacement for iTunes or Windows Media Player. Obviously, its still a beta version so there are some niggles with the program — it locked the interface for the duration of one track, although it had worked fine previously, and there are a couple of error messages when you close the program. Winamp continues to evolve, and the new and bold features are a worthy update in which to mark the application’s tenth anniversary. * Reports on the web suggest that Apple’s latest iPods (the Nano Video, Classic and Touch) break the ability to manage the device’s music library using software other than iTunes, including Winamp. Update: hackers have unlocked the DB, so it may be just a matter of time. Blah. Songbird [http://www.songbirdnest.com/] already does this, plus is cross platform. winamp has supported the remote feature for a couple of builds now…. “winamp has supported the remote feature for a couple of builds now….” I wasn’t aware of that, but I’m sure they’ve added new device support, including the next gen. game consoles. And Songbird integrates w/ your iTunes library and your iPod. It already went where iTunes didn’t dare, and with a decent bit of flair, too. IIRC, iTunes was the first media player to sport both these functions. Unfortunately the RIAA forced iTunes to rid itself of library sharing, but MP3 Blog (Podcast) support is still alive and well. Do your research before spreading FUD like this. In iTunes you can subscribe to an RSS feed with mp3 enclosures, yes. Designed for subscribing to podcasts. But it doesn’t have a built in web browser with pre-populated links to mp3 blogs does it? 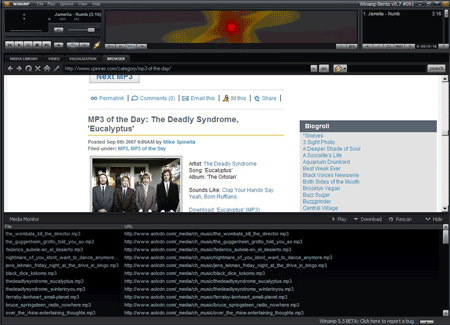 This means you can surf an mp3 blog through Winamp, read about the music and see a playlist appear with any mp3s linked. You then get the option to download them. iTunes doesn’t go nearly that far. itunes doesnt do the blog thing at all.. there is a big difference between a blog and a podcast. Songbird does… and works quite well on the mac and linux… but I’ve yet to get it running on my Windows box. But it is still very alpha at version 0.2 so that is not a surprise. Of course winamp would presumably have the advantage of the many many many years of development, plugins, skins, etc. Which had already provided the sharing thing.. but probably not as smoothly. (I’ve yet to check this new version out). But unfortunately is still a windows only appp, which is more often a problem these days. I don’t agree that having the skin all one solid window is a good thing though. I like being able to cut away the parts I’m not using. That and the visualizations is what keeps me using winamp instead of one of the many other apps. I hope there will be support for the old skins. Bleh, who uses winamp anymore? if you use itunes you could use this plugin on both mac and windows. the interface is the only reason i use it… wryyyyyy! Peel does the mp3 blogs much better, getpeel.com, not as bloated as Songbird and you can subscribe to blogs. winamp has always been better than itunes. I’d try it again if there was a OSX or Linux version. 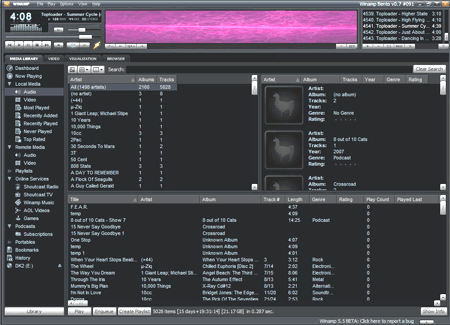 Unfortunately, Songbird developement is on a slow boat around Tierra del Fuego..
What the developers at Winamp have offered with this release (err beta for now) is a pretty logical and definitely needed interface change (via the Bento skin) . I think it’s very well done and has just become my player of choice.. once again. Song blog access is a major plus for this new version and should create something of a stir IMO. Nice article and Thanks for the heads-up, Ryan.. I might have missed all the changes, if you hadn’t written this up. Side note.. database handling is light years ahead of WMP 10 or 11… with a collection of 40,000+ songs, this beta is not choking on dealing with the load.. more than I can say for WMP, which is sluggish to say the least. the shoutcast tv thing is pretty cool also. i watched some full length movies streamed over the inter web the other night. Love Winamp for it’s modularity and don’t use it for anything but music, but I hate the media library. Mexp (plugin) is so much better when it comes to organizing your MP3s. I love Winamp, but this thing looks monsterous. 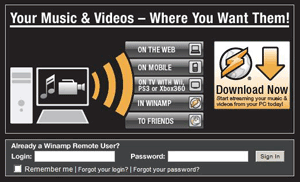 Winamp grows along with the internet growth itself. No other media players have such histories. I’ve used winamp for years..
I’ve been using iTunes + Hamachi for some time to stream my music from home to work, and it works incredibly smoothly – browsing my library is simple, and songs start playing practically instantaneously. With that said, I’m not a huge iTunes fan and would love to switch to something else if they can just get that piece in place with the same ease of use. So I downloaded the Winamp beta and was less than impressed for a few reasons. 1. Why do I need to separately add my music to the “remote music” section? I suppose the rationale is that I may not want to share my entire library, but I’m thinking that at the very least there should be some interoperability between your library and what is shared… there is not. 2. When browsing my shared library at work, hitting the play button in the “remote music” section launched Windows Media Player! I’m supposing this is because I neglected to set file associations during the install, but should that really be necessary to get mp3’s that I’m selecting from WITHIN Winamp, to play IN Winamp? 3. Very cludgy and slow to access the remote library – my guess is that its partly because its going through the Orb servers to hit my home PC and not going direct. All in all, the sharing piece comes nowhere close to what I’ve achieved using iTunes + Hamachi, and for that reason, I’ll stay away unless there are significant changes and improvements by the time this comes out of beta. I only hope the loading time gets better. Winamp is one of the few applications I can say I have used for over 10 years — perhaps sharing that title with only MS Word.. Good to see development is still going strong on this application, although I’m afraid that feature bloat may increase its already relatively high loading time..
check out wuforever.com media jukebox. Plays anywhere. no special plugins needed. ZERO resources (uses browser process).